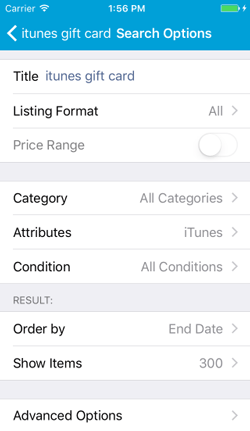 GarageBuy remembers which items you already looked at and for each search it will show the number of listings you haven't viewed yet. The smart auto-read feature marks listings as read while you scroll and in addition you can hide listings you already looked at from search result. The perfect eBay browsing experience! No need to jump back and forth between search result and listing view: Simply use the next/previous listing buttons in listing view to browse through the listings quickly. Of course, GarageBuy automatically saves all search settings for you. 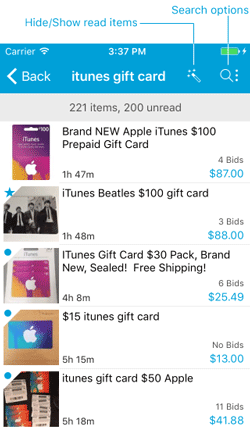 Place bids and purchase eBay items from within GarageBuy on your iPhone and iPad. The bid panel provides you with a big countdown display. 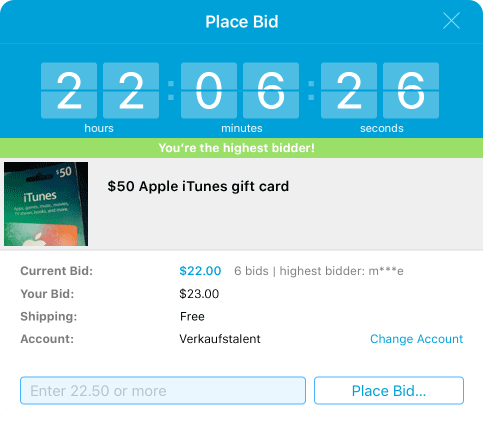 When you are bidding on an auction that has reached its final phase, GarageBuy will update the current bid status automatically. Check how your watched items are doing. Watched and previously bought items will be imported from 'My eBay'. You can mark any listing as a favorite by simply tapping on the star icon in item detail view. If enabled in the preferences, GarageBuy creates a new calender event for each new favorite item. You can even set the time alerts will show up before the favorite ends. GarageBuy supports multiple eBay sites like eBay USA, Canada, Germany, France and UK. Happy bidding all around the world!